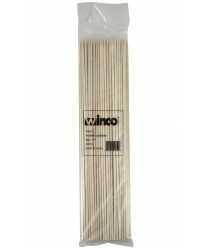 Bring more color and taste to your buffet or tabletop presentation with the Winco WSK-12 Bamboo Skewers, 12", (100/Bag). These 12-inch eco-friendly skewers let you stack beautiful meat and vegetable combinations in preparation for grilling. The classic bamboo skewers are smooth and rounded, and they taper to a fine point that pierces chunks of chicken, beef and vegetables with ease. Also appropriate for fresh fruit kabobs, these skewers are as versatile as they are easy to work with.